The main aim of my work is to envision new ways of living the museum experience. I strongly believe that experience of Arts can be trasformative. Each museum has the potential to be an ideal place for learning, thanks to the live encounter between people and the artworks. As an Art Museum Educator, I work to create the conditions that make possible meaningful experiences of the artworks. Sometimes these experiences can be life-changing, trasformative. Generally in museum hall the “sight” is the predominant sense: How can I offer to the visitors a more dynamic sensorial experience? The key I choose to bring people closer to art is the body. Putting the body at the centre is the key to involve feelings. This form of ‘embodiment’ is the premise to design museum experiences, educational projects and workshops. design and development of educational programs, cultural projects and art mediation format for museums, teachers, schools. “Through the stage to the museum” - Performing arts in museums : practices, audiences, "cultural mediation"
An art historian, museum educator and researcher, I work with museum projects that aim to create a more effective connection between the public and contemporary art. I design educational formats including ‘per_formative’ guided tours, museum experiences and workshops that encourage the active participation of the public through the involvement of emotional and imaginative resources. My work, in constant update and research, focuses on the experimentation of interdisciplinary activities, between art and education. I design and develop educational paths for museums and advanced training courses for art professionals and teachers. ​I regularly collaborates with museums, festivals, institutions and associations to create and develop cultural programs and innovative teaching techniques. I have collaborated for the education department of MART, Museum of Modern and Contemporary Art of Trento and Rovereto (Italy), Palazzo Grassi - Punta della Dogana, Venice, National Gallery, London and Galleria Nazionale d'Arte Moderna, Rome. ​Currently I work for Tuttestorie Festival of Children's Books (Cagliari). 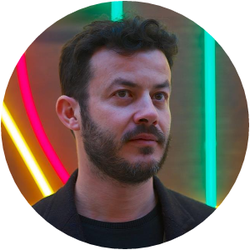 ​BIO: Marco Peri – Il est historien de l’art, expert en programmes d’éducation artistique, chercheur and designer d’expériences d’art participative crées à partir du corps et du mouvement. Il crée plusieurs cours interdisciplinaires fondés sur les liens entre l’art et autres formes de connaissance. Il est chef de projets d’éducation, culturels et de création de matériels pédagogiques pour des musées, pour les enseignant professeurs pour les , écoles et autres institutions éducatives.